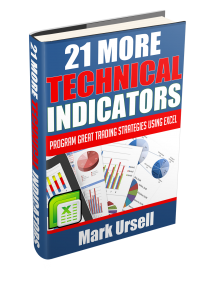 This eBook is a follow up to my previous book – How to Calculate 21 Technical Indicators Using Excel. In this book, I investigate 21 new indicators and chart patterns. I show exactly how each one of them is calculated using Excel formulas. I also describe what the indicators do and show many examples of the indicators on charts. This book is packed full of suggestions and ideas about how to use the technical indicators. This includes suggestions for how to use the indicators, ideas for trading strategies and examples. The eBook comes with a free Excel spreadsheet containing all the indicators. Once you have the book, you can get the spreadsheet and start work straight away. The best data available to a trader is how the markets behaved in the past. We can use this historical data to observe and analyse how indicators and strategies performed in the past. Excel is a great tool for handling data. Once our indicators and trading patterns are programmed into Excel we can get quantifiable data. We can find out what works well and what doesn’t. Using Excel, we can check for seasonal and time of day patterns. We can assess whether our theories about the markets are accurate or not. Excel can also be used to backtest your strategies under different conditions and over different time periods. What Indicators and Chart Patterns are Included? The book is available from the Amazon Kindle Store. Click on the link below to see more.